Senate Minority Leader Mitch McConnell, R-Ky., at the American Enterprise Institute in Washington in June 2013. Alison Lundergan Grimes, the Kentucky secretary of state and a Democrat, announced on Monday that she will challenge Senator Mitch McConnell, a Republican, in 2014. Mr. McConnell, the Senate minority leader, is likely to win re-election. Kentucky is a solidly Republican state, and President Obama received less than 40 percent of the vote there in 2012. Mr. McConnell has also amassed a huge war chest and hired Jesse Benton, who led Senator Rand Paul’s upset win in Kentucky in 2010, to run his campaign. However, he is unlikely to sail to victory. Ms. Grimes was elected to statewide office in 2011 with 60 percent of the vote. She has deep ties to Democratic politics, both in Kentucky and nationwide, as the daughter of the state’s former Democratic Party chairman, Jerry Lundergan. Those connections and the high-profile nature of the race should make it relatively easy for her to raise money. While there have not yet been any nonpartisan surveys testing a potential contest between Mr. McConnell and Ms. Grimes, the four partisan polls that have been conducted so far (three by the Democratic-leaning Public Policy Polling and one by the Republican-leaning Wenzel Strategies) have shown a relatively tight race, with Mr. McConnell leading by an average of 4.5 percentage points. A SurveyUSA poll conducted in June for The Courier-Journal found that 34 percent of registered voters would vote against Mr. McConnell no matter who his opponent was, double the 17 percent who said they would vote for him regardless of his opponent. Those numbers reflect the fact that Mr. McConnell is fairly unpopular in Kentucky. Public opinion surveys show that, on average, more Kentuckians disapprove than approve of the job he has done in the Senate. Roughly half of the respondents in the four recent partisan polls said they disapproved of Mr. McConnell’s performance. On average, Mr. McConnell has a net job approval rating of minus 7 percent. 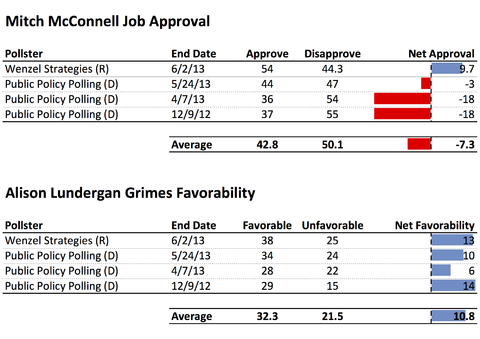 Ms. Grimes is not as well known, but she has a net favorability rating of plus 11 percent. It is possible, though, that as Ms. Grimes gets drawn into what is likely to be a bitter, partisan campaign, her numbers will deteriorate. If the 2014 race proves competitive, it will not be the first time Mr. McConnell has had to sweat a close election. He was first elected to the Senate in 1984 by 0.4 percentage points, and was re-elected in 1990 by four percentage points. The next two times he faced the voters, in 1996 and 2002, he had larger cushions. But in 2008, he defeated the Democratic nominee, Bruce Lunsford, by just six percentage points: 53 percent to 47 percent. At the time, Mr. McConnell, while not widely popular, was more popular than he is now. And Mr. Lunsford’s favorability numbers were not as strong as Ms. Grimes’s currently are. Still, the 2008 cycle featured a presidential election and large Democratic gains nationally. Midterm elections have historically favored the party that does not control the White House. In 2014, that will be the Republicans. In many ways, Ms. Grimes faces a challenge similar to that faced earlier this year by Elizabeth Colbert Busch, the Democrat who challenged Representative Mark Sanford in a special election in South Carolina’s First Congressional District: to defeat a vulnerable Republican opponent — Mr. Sanford because of his past scandals and Mr. McConnell because of his mediocre popularity — on solidly Republican terrain. Ms. Colbert Busch lost that race, and Ms. Grimes, too, will have a hard time overcoming Kentucky’s Republican gravity. The McConnell campaign will probably attempt to tie her to Mr. Obama, who remains highly unpopular in the state.